Toasted French bread like you’ve never had before! 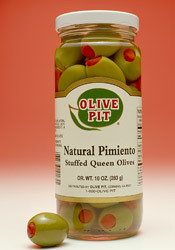 The Natural Pimiento Stuffed Olives are the perfect addition to the cream cheese for a sensational taste. Combine all ingredients except bread. Mix well. Spread on each half of French bread. Broil until cheese melts.